NASA Rover Finds Evidence That Mars Once Had Lakes : The Two-Way A new study suggests the Red Planet had some blue on it about 3.5 billion years ago. Mars' massive Mount Sharp may have formed billions of years ago as water carried sand and silt into the center of a large crater. Mars is cold and dry, but billions of years ago, it was cold and wet. That's according to new evidence from NASA's Curiosity rover, which is currently exploring a large crater on Mars. The rover has found geological evidence that lakes of liquid water existed in the crater 3.5 billion years ago. "The lakes may have existed for hundreds of thousands of years," says John Grotzinger, a researcher at Caltech and chief scientist for the rover. But he adds, the lake network may have stuck around for millions of years. This is the second big water announcement NASA has made about Mars recently. Last week, the space agency revealed evidence that salty, liquid water still flowed in small amounts on the surface. Rocks on the surface of Mars suggest that liquid water pooled on the surface and remained there for long periods. Those salty streaks are remnants of a far wetter early Mars, Grotzinger says. The mountains around the crater would have once had ice-capped peaks, and water flowed down from the crater rim to its center. "Small streams and rivers flowing, maybe ankle deep to waist deep and then arriving at deltas where the water would have slowed down and let out into a lake," he says. Scientists believe the lake was centered on what is now a massive mountain. 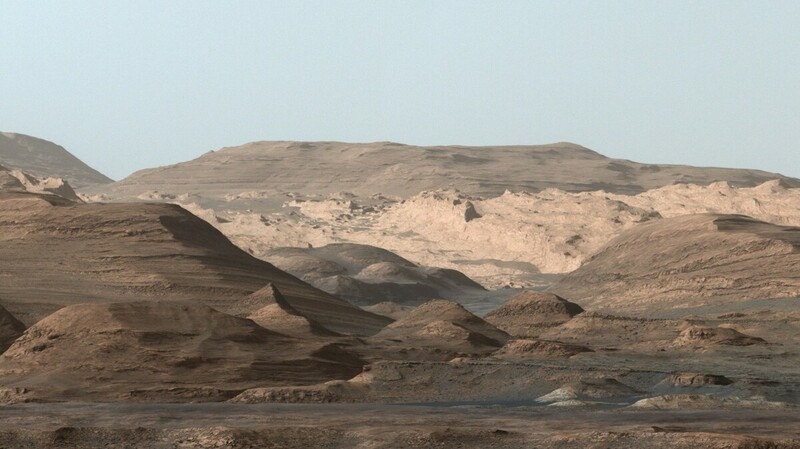 Known as Mount Sharp, it was created by sediments carried by the water into the crater, Grotzinger says. "The paradox is that where today there was a mountain, there was once a basin," he says. The new research, which appears in the journal Science, also could have implications for whether Mars once might have hosted life. The lakes coincided with the period when the earliest known microbial fossils appeared on Earth. Given that, "why wouldn't life have gotten started on Mars?" Grotzinger says. "It seems like it was quite similar to the Earth." Nobody quite knows why Mars dried out. Grotzinger says one theory is that the water slowly evaporated as the planet's atmosphere was weathered away by the solar wind.